Lekkerdroom Farm is set between Tesselaarsdal and the Hemel en Aarde Valley. 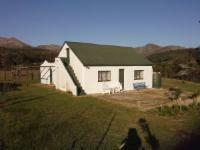 It is 25 kilometres from Caledon and 40 kilometres from Hermanus.There are four cottages available on the farm. The first cottage, Boertjie se Droompie, can accommodate up to six guests and has two bedrooms and additional beds in the living area. The kitchen is equipped with a fridge, an oven, and a fireplace. Lê-Lê Huisie has an open-plan layout with a bed, a private bathroom, and a kitchenette. A braai area is available to all guests. Damhuisie ia a 2 adult 1 child sleeper. This unit is equipped with a double and a single fold up bed. on-suite bathroom, kitchenette, covered braai areaOugat is a openplan unit for 2 adult 2 kids. This unit is equipped with a bathroom, kitchenette, Loft with mattresses, double bed and a covered braai area. Guests can enjoy various activities on the farm such as birdwatching, swimming, and fishing.You can also enjoy all the farm animals such as Zebra's, Springbuck, Camels, Llamas, parrots, sheep and many more.Wine tasting is also a very popular excursion in this area. 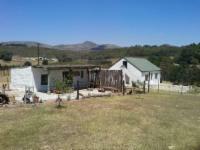 Key deposit of R100 on arrival payable in cash only. Our family had such a lovely weekend at Lekkerdroom. Lucus is such a friendly host, his little boy Luke was a little tour operater, and was so clued up in all the giraffes, zebras, donkeys etc. We will definitely be back very soon and recommend it to anyone who is looking for a piece of peace . We absolutely loved our stay at Lekkerdroom Farm! The animals were incredible, the cottage had everything we needed, and the peace and quiet was perfect. We would highly recommend this place! The fireplace in the kitchen was great, we sat around having drinks and dinner in the kitchen instead of infront of the tv. 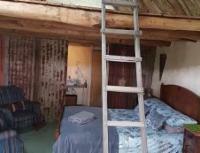 Le Le cottage was gorgeous. It was perfect for my little Pug and I. I found the whole farm utterly charming and quirky. Lucas was very helpful and friendly. We'll be back. Lekkerdroom Farm is 17km from the centre of Caledon , the nearest airport 109.4km (Cape Town International Airport).